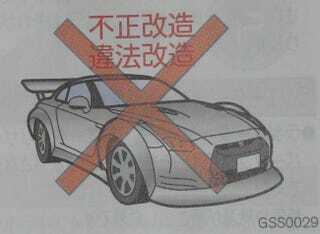 Just in case you've bought a new GT-R, but you lack any common sense when it comes to vehicular accessorization, Nissan has included these helpful illustrations in the owner's manual for the JDM version. We're guessing the big X means you're not supposed to put giant fender flares and oversized spoilers on the GT-R. Nissan apparently thinks they got it right on their own, thank you very much. Although someone better tell that to Mine's. The other illustrations have more helpful hints; like how to use a strategically placed cola can to sabotage someone's brakes, or how to push your unsuspecting buddy's GT-R onto a railway crossing. You know, the little things kids these days do for a laugh. Mine&apos;s GT-R Runs 59.4sec Lap of Tsukuba, Coming To US?